Though, India tops the list with maximum number of anaemic women and children in the world. Nine states are the worst sufferers. 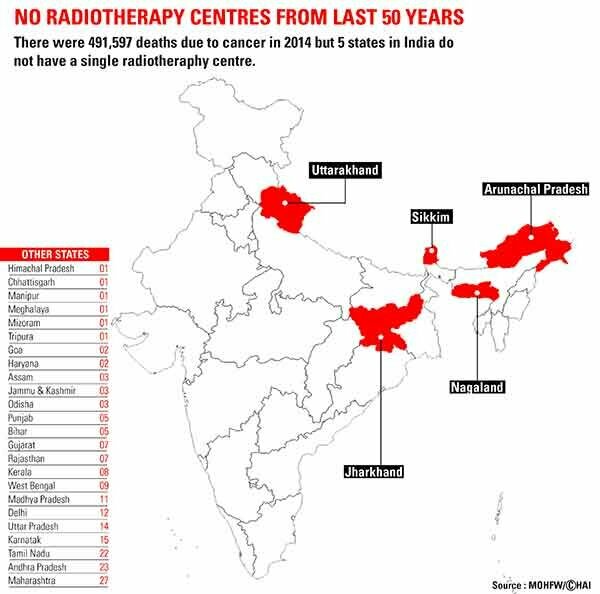 As per ICMR data, every year there are 11 lakh new cancer cases in India and five lakh cancer deaths. Most of the deaths happen due to dearth of doctors, poor treatment and lack of diagnostic devices. There were 6.3 million Tuberculosis cases reported in 2014 worldwide, out of which 25% of the cases are from India and the disease is strengthening its grip in India. Vector borne diseases are spread through insects like mosquitoes. A key focus of the healthcare agenda for 2017 should focus on vector borne diseases. Human resources in rural areas is a major issue across India. Primary Health Centre (PHCs) are state-owned rural health care facilities in India. Most complications and even death at childbirth could be prevented if women had access to skilled birth attendant which can be a doctor, a nurse or a midwife. India is battling an outbreak of fevers. Each of ICMR's 40 laboratories across India test anything up to 1,000 blood samples a month. The fast moving metro cities are considered to be a hub of suicides because of the stress, depression and ever-changing environment. India has the largest number of stunted children in the world, at least 48 million under the age of five. Why are young girls dying in India? Between 2011 and 2020, more than 140 million girls will become child brides, according to United Nations Population Fund. Girls who are married young are more vulnerable to intimate partner violence, sexual abuse & HIV. Infant mortality rate (IMR) refers to deaths of young children, typically those less than one year of age. It is measured by the number of deaths of children under one year of age per 1000 live births. India is home to the largest number of under-five child deaths in the world. The biggest killers are diseases which are preventable if children are timely vaccinated. NCRB has started collecting data on female foeticide since 2014. A total of 50 cases were reported under female foeticide in 2014. 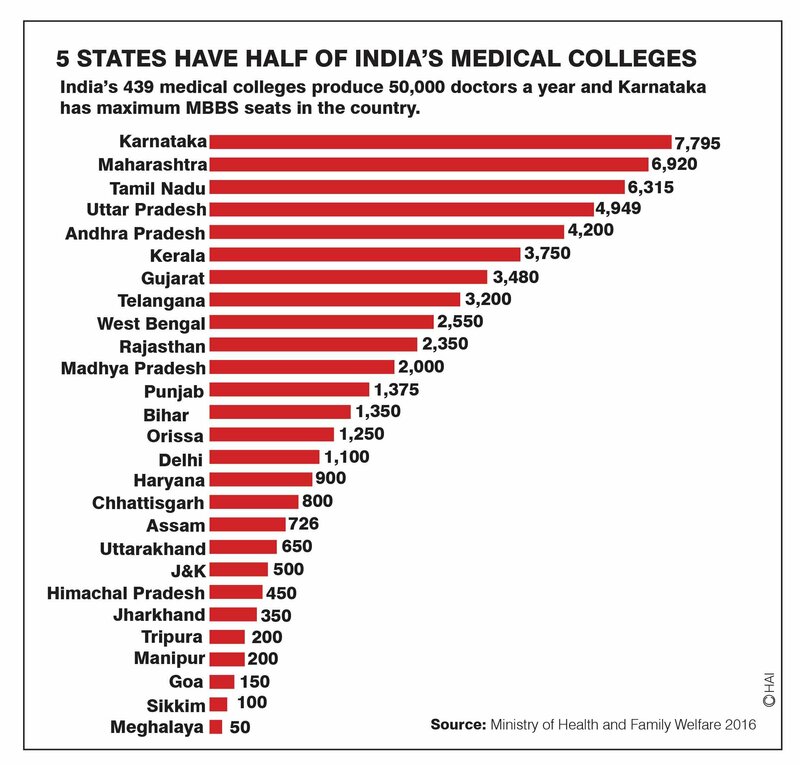 Five Indian states have half the number of medical colleges of the country.Karnataka tops the list with 53 colleges and 7,795 MBBS seats closely followed by Maharashtra. 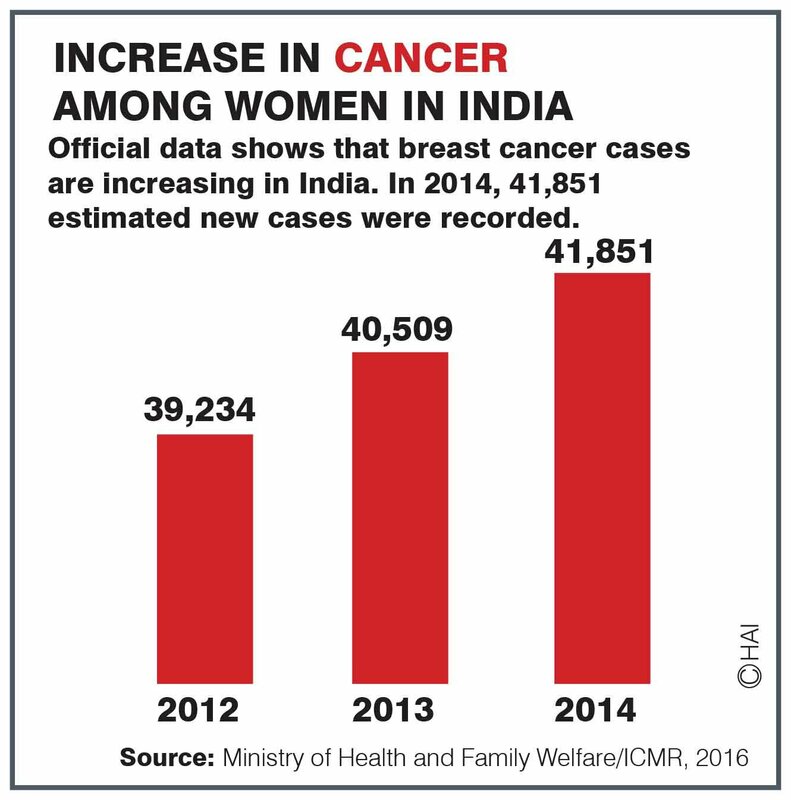 As per the stats from Ministry of Helath and Family Welfare India witnesses almost a surge of more than one thousand breast cancer cases since past three years. Breast cancer is becoming one of the leading causes of death after cervical cancer. Hospitals in the national capital Delhi are swamped with malaria patients these days. The problem is that mosquito-borne disease is difficult to diagnose. 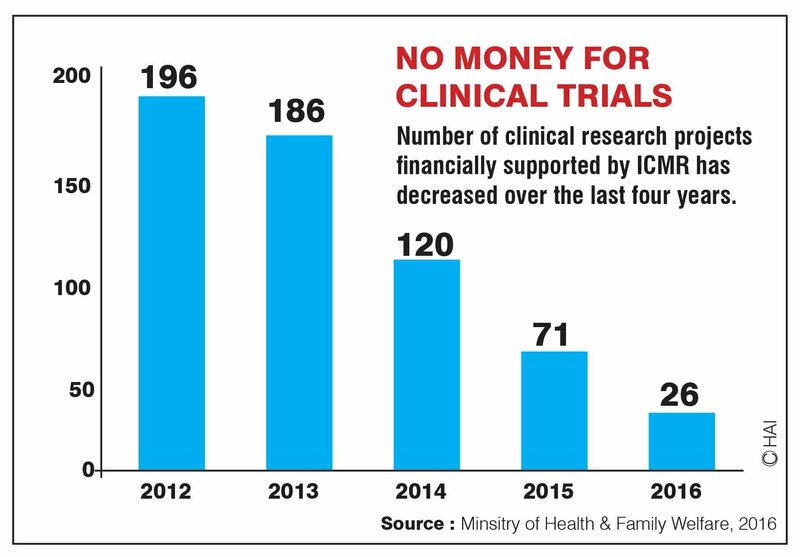 Over the past few years there has been a sharp dip in the number of clinical trials carried out. The number has reduced from a steep 196 to only 26. Where is India's female health staff? The problem of shortage of healthcare workers in India is not new but India continues to face grim shortage of healthcare workers. This has been highlighted time and again. The World Health Organisation’s 2000 World Health report ranks India’s Health care system as 112 out of 190 countries. In 2005, India officially “eliminated” leprosy, abandoning its battle against the disease, under the pretext that it had less than 1 case in 10,000 people. Data from National Sample Survey, 2014, point to a steady increase in the cost of health care and WHO estimates out-of-pocket spending as a percentage of total health spending to be 62.42 per cent in India in 2014. Government data on traffic deaths misrepresented the number of pedestrian and motorcycle deaths as mentioned by researchers at Johns Hopkins University. There are almost six lakh pharmacists in India and Indian Pharma industry has seen a spectacular progress. The industry ranks 4th in volume and 13th in value in the global pharmaceutical market. Non Communicable Diseases (NCD) is emerging as the leading cause of death in India. As per the data from Registrar General of India almost 42% of all deaths are due to NCD’s. 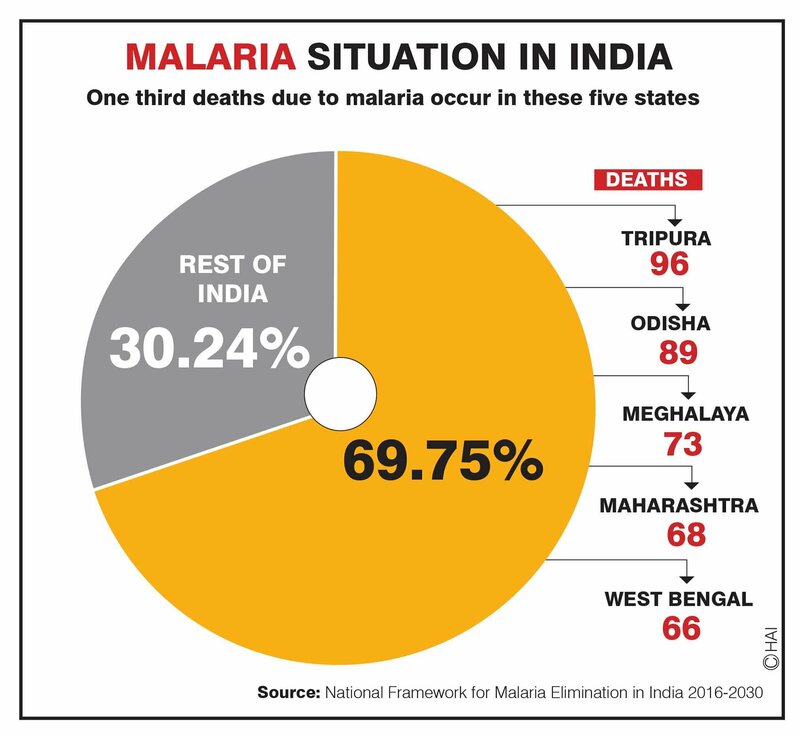 India’s health infrastructure is facing one of the grimmest challenges. Not only there are less than required primary health centres in India but almost 40 per cent of them are understaffed. 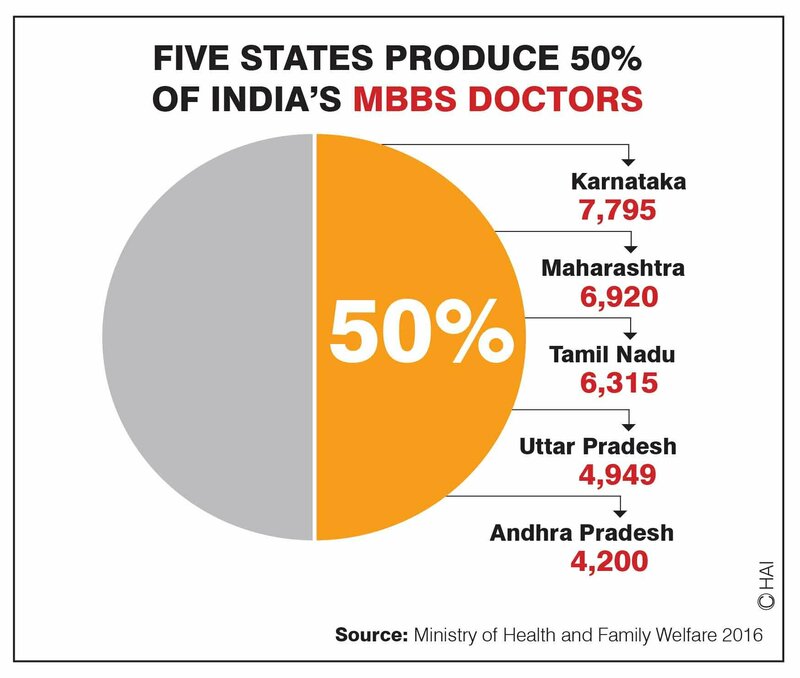 Official data shows that 9.29 lakh doctors are registered with the Indian Medical Registrar and the country churns out 30,000 doctors and 18,000 specialists every year. Burden of mental illness will increase more rapidly in India than in China over the next 10 years says Lancet report. More than six per cent of the total population is suffering from mental disorder said India’s Union minister of health in 2015. Mission Indradhanush aims to immunise all children against seven vaccine preventable diseases. Under this, the ministry identified 201 high-focus districts which account for nearly 50% of all unvaccinated or partially vaccinated children in the country. The demand for mental health services is expanding. The burden of mental illness will increase more rapidly in India than in China over the next 10 years and the two countries account for one third of the global burden of mental illnesses says a Lancet study. According to WHO, there are 45 million blind persons in the world, of whom 12 million are in India. Also, India has 3.5 million people with corneal blindness and unfortunately, the corneal blind population of India is the largest in the world. Is alternative medicine a solution? Homeopathy is practised in more than 80 countries in different forms. India today is the hub of homoeopathy in the world. India’s current organ donation and transplantation system is nowhere close to the requirements for organs in the country. India holds the title as the country with the most suicides in the world. A closer look at the data shows that more than half suicides in India are happening in the five southern states. Availability of medical infrastructure is crucial for qualitative healthcare delivery. Karnataka falls in the category of states with maximum number of bloods banks in India with pool185 blood banks. How grim are India's suicide stats? Increasing suicide death is worrisome & the rate of suicides in India is growing rapidly with 1.31 lakh suicide deaths last year as per gov data. Anaemia remains a major health problem in India. 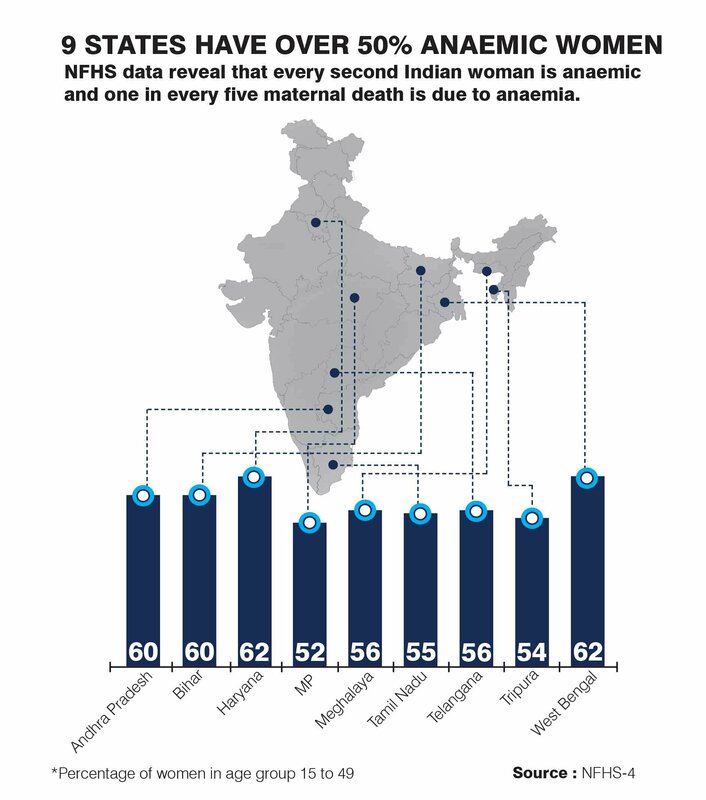 More than half of women are anaemic in eleven states as per the latest National Family Health Survey-4.